In some of the best news the B&T office has heard in some time, Arnott’s has decided to stop messing with the recipe of its famed Shapes biscuits and return to the original. 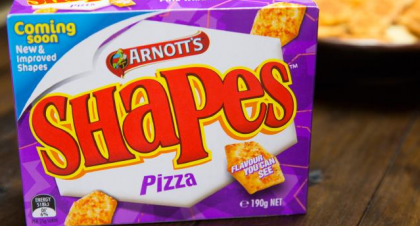 Back in April, for some unexplained reason, Arnott’s decided to meddle with its iconic flavours like Barbeque, Pizza, and Chicken Crimpy. The changes infuriated Shapes fans who complained the biscuits were softer, lacking their usual (highly salty) flavour, and appeared to be missing the cracker’s trademark herb sprinkle. At the time, Arnott’s defended the changes saying they had been bought about by extensive market research. Tested on “thousands, literally thousands, of Shapes fans”. However, the changes clearly didn’t resonate with consumers and today the biscuit manufacturer has decided to shift back to the original recipe.